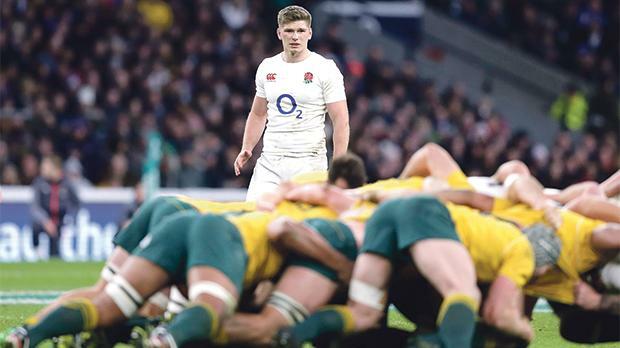 England’s Owen Farrell looks on during scrum action at Twickenham. Paul Gustard believes George Ford and Owen Farrell can build the attacking menace to steer England to World Cup glory in 2019. England equalled the record 14 consecutive wins achieved by Clive Woodward’s class of 2003 with Saturday’s 37-21 victory over Australia at Twickenham. Eddie Jones’s side have pulled off a perfect calendar year of 13 wins in 13 matches – but assistant coach Gustard insists England still have “plenty of room for improvement”. Defence coach Gustard expects free-flowing attack to dominate Test rugby’s coming years – and insisted England can be at the vanguard of an exciting evolution thanks to twin playmakers Ford and Farrell. “There’s two sides to the ball... the defensive side and attacking element,” said Gustard. “You can pick a team that’s going to be defensively very solid, or you can pick a team that’s going to attack, and then work on them defensively. “We have identified that to win the World Cup, you need to score a lot of points. You need to score tries. “That’s the way the game’s going, the game’s favouring attack. “And if you’ve got two playmakers on the field at the same time, in George Ford and Owen Farrell, then you’re going to strengthen your case and be able to do that. “We’ve got a litany of talent in the Premiership, English-qualified players that can do some magical things. “We need to harness that, give them a framework to attack and a framework to play. Former Australia coach Jones claimed the last laugh over his compatriots and also old Randwick team-mate Michael Cheika as England secured a fourth win in 2016 over the Wallabies last weekend. England’s first perfect calendar year since 1992 has comprised a Six Nations Grand Slam and a Test series whitewash of the Wallabies in Australia. But despite all the progress and tumbling records England’s coaching staff are seeking yet more improvement. Gustard remains adamant England can still scale new heights in 2017, admitting “all the players speak about is being no.1”. Taskmaster boss Jones maintains that England can only be considered the best team on the planet by claiming World Cup glory in Japan in 2019. By laying down that gauntlet, Jones and his coaching staff are battling hard to ensure their side does not peak too soon. “It will be hard to top 2016 but not impossible,” said Gustard. “We’ve got the players and the talent, and if you’ve got the players and the talent you’ve got a good chance. “We believe in the group that we’ve got and we think we’re improving as a team. But we actually think there’s still plenty of room for improvement. “We think we’re better than we were, and we think we’ve got a great chance next year to continue our growth and development towards trying to become the number one team in the world. “We can perpetuate the message that to be the world’s best we have to win the World Cup, but it’s up to the players what they believe and what they want to achieve. “And the players, all the players speak about is being number one in the world now.